Text on button actually translates to "overcharged"
GENEVA, Switzerland (CNN) -- The Obama administration has been talking about "pressing the reset button" with Russia after relations "crashed" when Russia invaded Georgia last August. 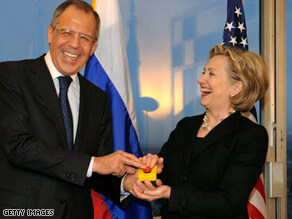 Russian Foreign Minister Sergey Lavrov and Secretary of State Hillary Clinton laugh about their "reset' button. When Secretary of State Hillary Clinton greeted Russian Foreign Minister Sergey Lavrov in Geneva on Friday before sitting down to their working dinner, she presented him a small green box with a ribbon. Inside was a red button with the Russian word "peregruzka" printed on it. "I would like to present you with a little gift that represents what President Obama and Vice President Biden and I have been saying and that is: 'We want to reset our relationship and so we will do it together.'" Clinton, laughing, added, "We worked hard to get the right Russian word. Do you think we got it?" she asked Lavrov. "You got it wrong," Lavrov said." Both diplomats laughed. "It should be "perezagruzka" (the Russian word for reset,) Lavrov said. "This says 'peregruzka,' which means 'overcharged.'" The question came up at the news conference afterward. "In a way, the word that's on the button turns out to be also true," Clinton said. "We are resetting, and because we are resetting, the minister and I have an overload of work." Asked by a Russian reporter whether he had pressed the button, Lavrov said that he and Clinton did, indeed. "It is big and red and I hope that Russia and the United States, and other countries will never press on another button which used to be associated with a destructive war," he said. The "overload," Clinton said, is a broad agenda of issues. "We are going to systematically go through each and every one of them," she added. Clinton said the two sides will get to work on re-negotiating a follow-up to the Strategic Arms Reduction Treaty and nonproliferation. On other issues like Afghanistan, the Middle East and Iran, Clinton said, "We will work through them." On issues where there is disagreement, Clinton said, "We are keeping those on the list because, we think through closer cooperation and building trust in each other, we can even tackle some of those differences." Lavrov agreed the burden of the agenda for the two countries is "enormous," but added: "I don't think either Hillary or I have any desire to be freed from any burden." Clinton called the encounter "a very productive meeting of the minds." She said both Lavrov and she are "very practical-minded" and will create a "specific set of objectives and responsibilities" to present to presidents Barack Obama and Dmitry Medvedev before the leaders' first face-to-face meeting in April at the G-20 meeting in London. On the START treaty, she said Russia and the United States intend to have an agreement by the end of this year when the treaty expires and are "going to get to work immediately" on it. Lavrov was asked about Russian intentions to install S-300 missiles in Iran. He said the decision "will be made exclusively on the basis of law in accordance with Russian law, and will be under expert control, which is one of the strictest in the world and of course in accordance with international agreements." Lavrov said the weapons Russia provides to its partners are "nondestabilizing, defensive weapons." In an apparent reference to U.S. military supplies to Georgia, Lavrov said, "We want our partners to act the same way and show restraint in military supplies to those countries where, including very recently, those weapons have been used very close to our borders." Senior U.S. officials who briefed reporters afterward, however, said they had not read Georgia into the minister's comments. They said the discussion ranged broadly over a number of areas and "we now have a very substantive work agenda that they just outlined." "It would have been easier and in a first meeting almost natural to be much more general but in this case it was very focused and very productive in laying out steps," one official said. On the proposed missile defense system the United States is considering installing in Poland and the Czech Republic, one official said, "Minister Lavrov made it clear he had listened quite attentively to Secretary Clinton's comments about missile defense ... and I think it's got them thinking."